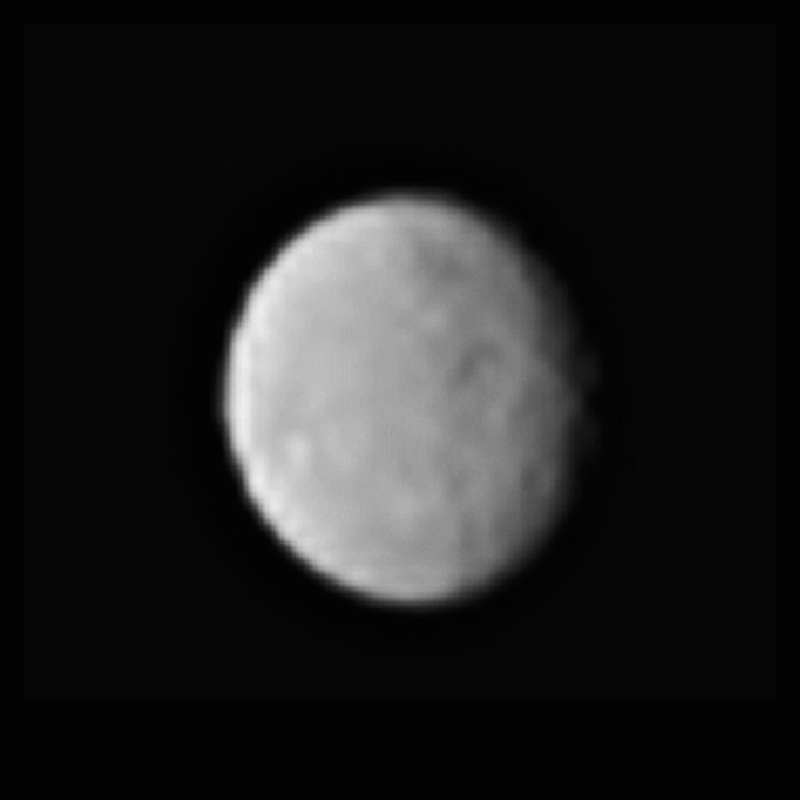 The Dawn spacecraft is on its way to Ceres, and has started sending back new images of the dwarf planet. The images are still pretty pixelated at this point, but we can begin to see features such as craters on the surface. Once considered a planet, then an asteroid, it is now considered a dwarf planet, and Dawn’s study of Ceres is likely to find several interesting surprises. We already know, for example, that Ceres has water. Spectroscopy of its surface shows that it contains hydrated material, and we’ve observed water vapor within Ceres’ thin atmosphere. Yes, Ceres has an atmosphere, but it isn’t remotely thick like Earth’s or even that of Mars. 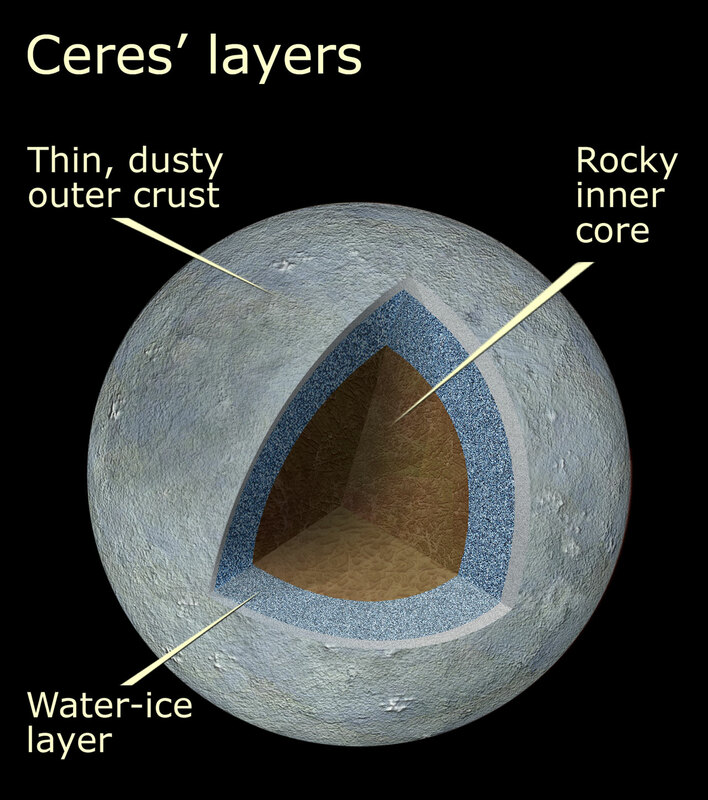 Because of this, it’s thought that Ceres has a rocky core with a mantle of water-ice. There are even some who speculate that Ceres could have liquid water within its interior, but that isn’t thought to be very likely. The approach to Ceres marks the second body the Dawn spacecraft has visited. It has already visited and orbited Vesta, giving us a detailed analysis of its geology and history. As it orbits and eventually lands on Ceres, it will likely do the same for the smallest of dwarf planets. Excellent news! What a “Dawn” lol it’s so exciting one gets giddy. That one area on the upper left no one has identified yet could be concave but looking at it in NASA video it looks convex – strange. Thanks for sharing!! There is a cute optical (more of a brain) illusion that is triggered when the source of light is at an “unusual” angle with respect to the object. Looking at an image taken from a rough surfaces that is illuminated from below usually triggers this. It messes with the brain’s bump and dent recognition probably because our brain is used to light shining from “above” and shadows being cast downward. For me that is a great challenge! Some pictures of Mars and Moon are out there that I can’t even wilfully see concave craters in them! The only thing I see is a bunch of “topologically wrong” bumps!!! 😀 Bumps that under close observation… do not cast shadows themselves… spoooky!